Individual villa with private heated pool and large games room, peaceful location next to golf courses, 10 minutes to the beach. All double beds are superking and each one can be split into two single beds. Casa Jahan is located on the edge of Almenara Golf in the peaceful and exclusive neighbourhood of Sotogrande Alto just 10mins from the beach and 5mins from Almenara health spa. Yet only thirty minutes from the larger resorts such as Marbella, the villa has easy access to all amenities, including the local shops and many excellent restaurants for eating out. The villa benefits from its own private heated pool, with a shallow end perfect for the children. Leading from the living room is a spacious balcony with stunning golf views, furnished with a table and chairs to enable you to dine al fresco. With six double or twin (optional) bedrooms, the villa is ideal for families, with plenty in the surrounding area to see and do during your stay. Very nice break with 7 friends playing golf. Perfect location, and set up for us. Peter was on hand anytime we needed help. We were a group of 5 golfers enjoying the great courses in the area. With 5 double bedrooms the villa can easily accommodate large families or groups. It is located in quiet area near Valderrama and Almenara golf courses and is 10 - 15 minutes from the marina and beaches in Sotogrande as well as the many restaurants in Sotogrande, Guadiaro and Torreguadiaro. The bedrooms, bathrooms and kitchen are finished to a high specification, and the outside areas including the pool are spot on. The owner responds to all queries quickly and ensured someone was there to meet and greet and provide keys. We all agreed we would like to come back with our families next time ! The villa had all the amenities to suit out parties needs. The pool was clean as was the property. We had ten people in the villa and there was ample room for us all. Peter made sure we had everything we required when we arrived and was very accommodating. Very nice place for families! We had a lovely stay at the family with our large family. It accommodated us perfectly as the villa is very spacious. The cots and high chairs for the babies saved us from having to bring our own and overall the amenities were great. We would not hesitate to book this villa again. Thanks to our host Peter who was very helpful. We spent a very enjoyable holiday at this beautiful villa last October. The online photographs don't really do it justice. It is a stunning property with plenty of space for a family. On arrival in Gibraltar it couldn't have been easier. The owners father was waiting for us, as arranged, as we came through from the small baggage reclaim ( and small but well stocked duty free) with the keys and then drove with us to the villa and showed us around the property. We understand this was because he was in Gibraltar at the time and cannot always do this but it was a very impressive service to start off our holiday. The villa is beautifully decorated and the pretty garden is well maintained. There is plenty of bedlinen, towels, pool towels etc. The kitchen is well stocked with everything you need to self cater and there are two terraces with ample room to eat alfresco. The TV and DVD player were excellent with plenty of English channels and a large selection of DVD's to choose from. A few minutes drive away is an excellent Supermarket plus there is a very large Carrefour in La Linea, about 20 minutes drive away. Sotogrande is very quiet. We wanted a restful holiday so this suited us but a car is essential. There are no shops within easy walking distance. We did several trips into Gibraltar which was fun. The Rock Tour is worth doing and it was lovely to see the Apes up close. We enjoyed the cheap low tax shopping, !! We also enjoyed a day trip to Estapona which is about 30 minutes drive away. It's a pretty town with good restaurants. Local restaurants were cheap and very good. We tended to go to Port Sotogrande to eat. Every Sunday there is an excellent Market in the Port area selling very good quality goods. We can truly highly recommend this villa for a family holiday. Peter Zammit went out of his way to make everything easy for us and on the one occasion we had to ring him (we couldn't find the clothes airer ) he sorted the problem immediately. 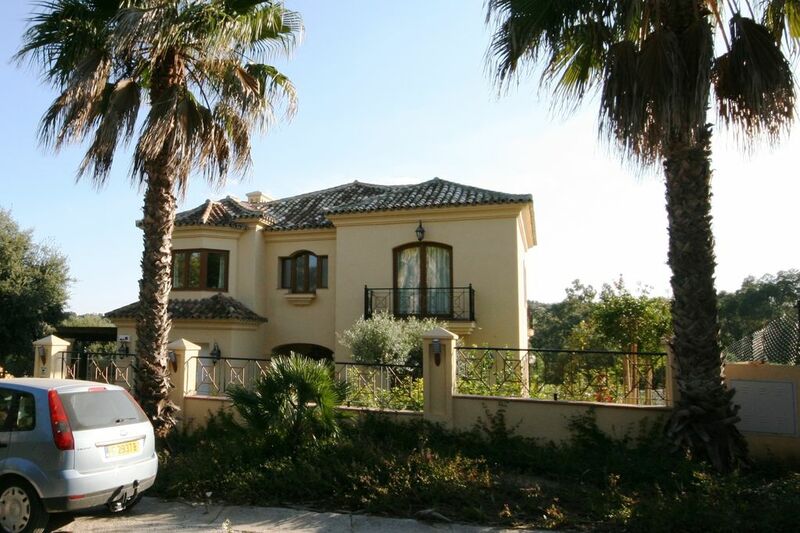 10 minutes drive is Sotogrande beach, tennis, port and restaurants. Here there is a sailing school and whale/dolphin watching is available. Wind surfing and Kite boarding is very popular in Tarifa and is approx. 30 minutes' drive away. 20 minutes drive to Gibraltar, 35 minutes drive to Puerto Banus and Marbella. A non refundable reservation fee of £500 and an £800 refundable security deposit are required. Owner not present on location. Rate depending on the number of persons. Check in time is after 4pm and check out time is before 11am. If pool heating is required there will be an additional charge based on usage.